I’ve signed up for the Western League, a summer cyclocross series around Bristol and Gloucester, and I was hoping to entice my son to join me on this foray into the world of CX racing. So, having already got the Cannondale CAADX for me, I had a scout around for a serviceable secondhand cyclocross bike and I hit gold with this Kinesis Crosslight Pro3. I’ll provide more details in the weeks to come, but suffice to say that it came from a bike shop manager who raced it previously, so it’s been meticulously maintained, and it feels blisteringly quick… certainly way quicker than my CAADX. 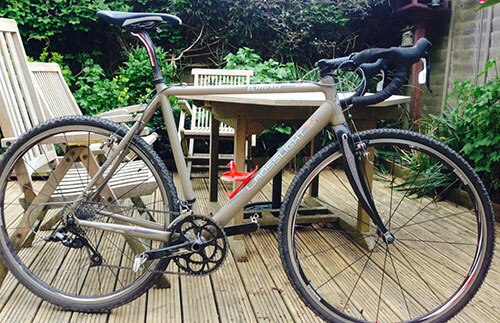 Update 14th May 2015 – I rode my first race on the Kinesis last night. We both survived and the Kinesis proved to be a comfortable and forgiving steed.